Michael Mina’s PUB 1842 has opened at the MGM Grand Hotel & Casino in the former space of his Seablue restaurant. The 1842 moniker represents the year the pilsner beer style was invented, and the casual tavern features a wide range of more than 60 American and international brews served by the can, bottle or one of 24 taps. A keg room, elevated dining booths, wooden bar stools, stone mosaic floors, vintage print wallpapers, plaid upholstery and butcher-block tables work towards an authentic space and welcoming environment. Highlights from the food menu include crab Louis, lobster corn dogs, Heritage Pork green chili and an extensive burger list with non-traditional versions such as a peanut butter crunch burger with bacon jam, potato chips and pimento cheese; and a Korean barbecue salmon burger with cucumber kimchi and Fresno peppers. The restaurant is open daily for lunch, dinner and late night. PUB 1842, 3799 Las Vegas Blvd. S., Las Vegas, NV 89109, 702-891-1111, 800-929-1111. Dinner in the Sky Las Vegas held a groundbreaking ceremony at its nearly nine-acre site near Tropicana and Polaris Avenues just west of the Vegas Strip. Owners hope to have the upscale dining attraction open in two months. It will offer a dining experience in which diners will be served meals suspended 180 feet in the air while appreciating 360-degree, open-air views of the Strip and Las Vegas Valley. Guests will be seated at one of two tables measuring 29’ x 18’ and weighing in at seven tons when fully loaded, which will be permanently attached to a 200-foot-high steel tower. Dinner packages will start at $290 per person and include a three-course meal with wine pairings and a photo. For information or reservations, visit dinnerintheskylv.com. Dinner in the Sky Las Vegas, 4750 S. Procyon Ave., Las Vegas, NV 89103, no phone. Iron Chef and Iron Chef America star Masaharu Morimoto has confirmed in a press release that he will open his first Vegas restaurant, Morimoto Las Vegas, taking over the space that currently houses Japonais at The Mirage. 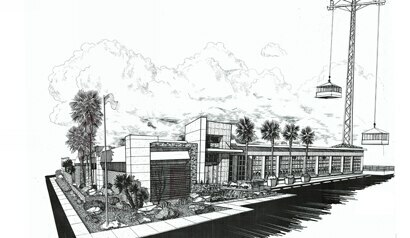 The restaurant will feature contemporary Japanese cuisine and his signature sushi; it is expected to open in early 2014. Morimoto Las Vegas, 3400 Las Vegas Blvd. S., Las Vegas, NV 89109, 702-791-7111, 800-627-6667. Mario Batali and Joe Bastianich have announced they will be opening B & B Burger & Beer in the former Rattlecan space in The Venetian’s casino. The eatery will be the fourth restaurant owned and operated by the duo, joining Otto Enoteca Pizzeria, Carnevino and B&B Ristorante, all of which are also located in The Venetian/The Palazzo Resort Hotel Casino resorts. The dishes will use local ingredients, and the beer menu will list beers brewed locally and in nearby Southern California. The burgers will be made from USDA Prime Black Angus beef ground fresh daily. The new 120-seat eatery will open sometime in the fall and will face the Vegas Strip. B & B Burger & Beer, 3355 Las Vegas Blvd. S., Las Vegas, NV 89109, 702-414-1000, 877-883-6423. Chef Jet Tila has returned to Las Vegas and has opened Kuma Snow Cream in the Las Vegas Chinatown District, serving the classic Taiwanese dessert also known as “snow ice,” “shaved snow” or “xue hua bing” that is popular in Hawaii and Asia. Tila’s frozen dessert is an ice cream and shaved ice hybrid, and features Asian flavors such as green tea, mango, taro, black sesame and honeydew. A selection of 12 to 16 dry toppings and sauces are available for guests to customize their snow cream. Kuma Snow Cream is open daily from 11 a.m.-midnight. Kuma Snow Cream, 3735 Spring Mountain Rd. Suite 206, Las Vegas, NV 89102, 702-816-5862. 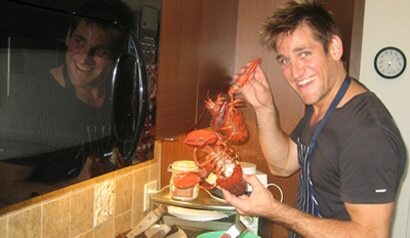 Australian chef, author and TV personality Curtis Stone (host of Top Chef Masters) will open up a pop-up restaurant at The Venetian July 26-27, serving a five-course tasting menu with wine pairings featuring recipes from his latest cookbook. The dinner will be served at 6 p.m. on both nights and the cost is $200 all-inclusive, which also includes an autographed copy of Stone’s cookbook What’s for Dinner? and a champagne reception. To order tickets, visit www.venetian.com. The Venetian, 3355 Las Vegas Blvd. S., Las Vegas, NV 89109, 702-414-1000, 877-883-6423. The Palm at the Forum Shops at Caesars Palace is offering Summer Lobster for Two through August 31. The special, priced at $79.95, includes a four-pound jumbo Nova Scotia lobster tail, two starters and two individual sides. The Palm, Caesars Palace, Forum Shops at Caesars, 3500 Las Vegas Blvd. S., Las Vegas, NV 89109, 702-732-7256. Treasure Island will honor National Mojito Day (July 11) by hosting Mojito Month at its Mojito Bar inside the Seafood Shack. Throughout July, during the daily happy hour from 5 p.m.-6 p.m. and 10 p.m.-close, four mojito creations will be offered for $6, including the Siren's Delight Mojito featuring Cruzan light rum, fresh mint, lime and ruby red grapefruit, St. Germain elderflower liqueur and a splash of soda. Seafood Shack, 3300 Las Vegas Blvd. S., Las Vegas, NV 89109, 702-894-7111, 800-944-7444. Tender Steak & Seafood at the Luxor Hotel & Casino, one of the few restaurants in Vegas serving bison on a regular basis, will honor National Bison Month with a bison tasting platter. Available throughout the month of July and priced at $60, the special consists of a trio of bison rib eye, top sirloin braised pot roast, and smoked sausage (made in-house) served with roasted fingerling potatoes and maple-flavored baked beans. A charred bison tenderloin carpaccio with chipotle relish, wild arugula and roasted red pepper mustard aioli will also be offered for $16. Tender Steak & Seafood, Luxor Hotel & Casino, 3900 Las Vegas Blvd. S., Las Vegas, NV 89119, 702-262-4852. Tacos & Tequila (T&T) at the Luxor Hotel & Casino has introduced a late-night menu served from 11 p.m.-close. Available throughout the summer, the menu created by corporate executive chef Saul Ortiz features guacamole, queso fundido, flautas, nachos, cheese or chicken quesadillas, habañero chicken wings and a three-taco combo --- including shredded beef, shredded chicken and pork carnitas --- all priced at $6. Tacos & Tequila, Luxor, 3900 Las Vegas Blvd. S. , Las Vegas, NV 89119, 702-262-5225. Scott Green has been named the new executive chef of The Buffet at Wynn. Prior to taking the helm at The Buffet, Green served as executive chef of the newly opened Bacchanal Buffet at Caesars Palace. Green has been in the food and beverage industry for more than 10 years; before launching the Bacchanal Buffet, he directed back of house operations at Little Buddha Restaurant and Sushi Bar at the Palms Casino Resort. The Buffet at Wynn, Wynn Las Vegas, 3131 Las Vegas Blvd. S., Las Vegas, NV 89109, 702-770-3340, 888-320-WYNN. Pastry chef Kamel Guechida, who recently left Joël Robuchon at the MGM Grand Hotel & Casino after working there since 2005, has been appointed the new executive pastry chef for all of Wolfgang Puck’s fine dining restaurants worldwide. Wolfgang Puck Bar & Grill, MGM Grand Hotel & Casino, 3799 Las Vegas Blvd. S., Las Vegas, NV 89109, 702-891-3000. The Japanese restaurant and sushi bar Hyakumi at Caesars Palace has closed. The restaurant originally opened in 1998, and its location directly across from the newly opened Nobu Restaurant Caesars Palace is thought to be the reason for its closing. After Nobu opened in April, Hyakumi had reduced its service to lunch only. Hyakumi, Caesars Palace, 3570 Las Vegas Blvd. S., Las Vegas, NV 89109, no phone.